Performance exhaust systems ensure that a vehicle's engine runs correctly. They also keep toxic exhaust fumes from entering the car. A high-performance exhaust system provides the best possible fuel efficiency and reduces harmful exhaust emissions that pollute the air. Other functions of an exhaust system are to mute the sound of the engine and reduce the exhaust temperature. Because cars can produce harmful gases during the combustion of fuel, it is important to visit a muffler shop right away if you suspect your exhaust system has a problem. 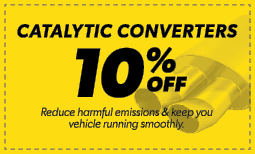 Stop by Meineke #70 in Salt Lake City, UT, for a muffler repair cost estimate. The more you drive your car in Salt Lake City, UT, your car muffler undergoes quite a bit of use and it needs to be kept in proper shape. If you notice a decrease in your fuel economy, a foul odor from underneath the vehicle or your car seems to be running louder, you should have your muffler checked. Depending upon the severity of the issue, you may be able to just pay for muffler repairs rather than a replacement. If you notice that your muffler is hanging low under the car, it should be addressed immediately. For a detailed diagnosis, contact a technician at Meineke #70 today. The exhaust system and muffler are some of the most essential parts of your vehicle outside of the engine. They are responsible for carrying the gases that your engine emits during the combustion process out and away from the engine, and away from you and your passengers. When this system fails or has issues it can become immediately apparent. If you suspect there is a problem with either your muffler or a component of your exhaust system, bring your vehicle to Meineke #70 in Salt Lake City, UT, for inspection and repair. An old or damaged high performance exhaust system can decrease engine function, waste fuel and pose a health hazard for you and your passengers. There are several issues that can result in suboptimal function in performance exhaust systems for cars. For best results, consult an experienced mechanic if you are having trouble with your car muffler, your custom exhaust systems or other components. While some issues can be resolved with repairs and part replacements, others can only be addressed by installing a new performance exhaust system. To learn more about keeping your high performance exhaust functioning smoothly, visit our Meineke #70 in Salt Lake City, UT. Once you learn that a new exhaust system is necessary to repair your vehicle, you may be wondering where to find the best muffler shop in Salt Lake City, UT. We have many locations available for you to choose from so you can get the performance exhaust system you need at a time and in a location that is easy and convenient for you. At Meineke #70, we understand that muffler repair cost is one of the biggest concerns on your mind. Fortunately, our technicians are committed to giving you the best service possible to make your aftermarket exhaust repair experience a great one. 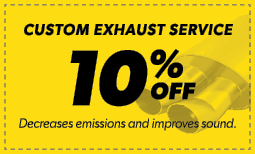 Stop by today to learn how we can improve your ride’s performance with one of our affordable custom exhaust systems.